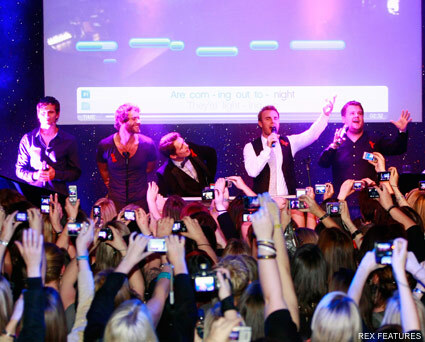 Take That hosted a packed SingStar extravaganza last night, which saw celebs including Kate Moss out in their droves. Flocking to the Tabernacle for some karaoke action, the famous faces then watched a blazing performance by Take That. At one point Gavin and Stacey comedian James Corden even ventured on stage, joining the famous band for an upbeat duet. Karaoke-mad Kate Moss was also seen perfecting some bizarre dance moves in case she had the chance to venture up for a performance. But the model never got the chance to grace the stage, and was later spied catching up with famous hairdresser pal James Brown. Packed to the rafters with famous faces, Pixie Geldof, Rachel Stevens, Remi Nicole and Paloma Faith were also spotted at the venue in Notting Hill. The crowd went mad as the Take That took the stage, and an excited Kate Moss jostled for prime position on a balcony, eventually getting the spot with the best view. It was certainly the coolest karaoke party we’ve ever seen! Would you like to see Kate Moss singing on stage? Let us know your thoughts in the comments box below.